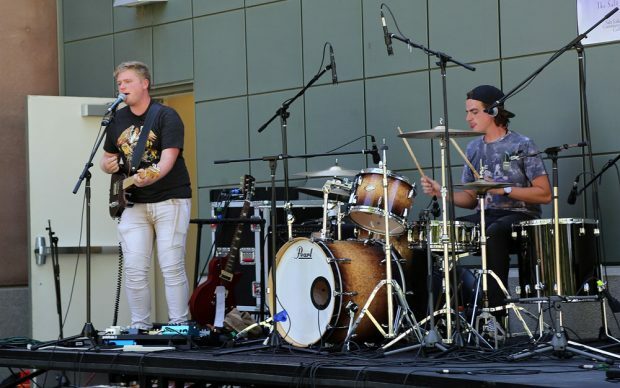 The fifth annual Bearfoot Festival showcased the audio production and musical skills of Salt Lake Community College students and local musicians. Bearfoot Festival is put together by Club Resonance, a club dedicated to the ‘quality of sound’ that works as the college’s student record label. For this summer’s event, Club Resonance partnered with Utah Foster Care to collect shoes and get students involved with the non-profit. The festival gives students a chance to put together a big-time music event on their own. Students are responsible for finding talent, setting up the stage, marketing and locations. “It’s cool doing this because we get immediate feedback from our fellow students, friends and teachers. We learn all the basics and get firsthand experience,” says Phil Millerberg, a member of Club Resonance. The club projects a feeling of passion for music, and through the event, the ability to show other students what their club and classes can offer to them. This year’s festival was a great turnout and the possibilities of this year’s attendees being next year’s performers are high. Contact Club Resonance for more information about the club and next year’s Bearfoot Festival. Club Resonance members run the sound equipment during the fifth annual Bearfoot Festival on Thursday, July 19, at South City Campus. Members of the band Hello Vertigo perform on stage during the fifth annual Bearfoot Festival on Thursday, July 19, at South City Campus. A student listens to the band play while running the audio board during the fifth annual Bearfoot Festival on Thursday, July 19, at South City Campus.